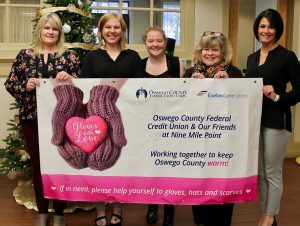 OSWEGO, NY – Oswego County Federal Credit Union announced the third annual “Gloves with Love” program to collect new hats, mittens, gloves and scarves for kids. Launching the program, from left, are: OCFCU employees Crystal Perry, Kelsey Truax, Robin Scarantino, Mary Greeney, and Danielle Hayden. “We wanted to come up an easy way for people to help make sure the kids of Oswego County will stay warm this winter,” said Mary Greeney, OCFCU vice president, member services. OCFCU and its partner, Exelon Generation, launched “The Gloves with Love” program from November 29 through January 5, 2018. Collection baskets will be available at each branch. Slightly used or new adult hats and winter scarves will also be collected. The adult hats and scarves will be placed on trees in various parks in Oswego, Fulton and Mexico on January 13. OCFCU is also working with Oswego County Opportunities and Diane Cooper-Currier in distributing items to children and adults in need within Oswego County. Offices are located at 90 E. Bridge St., Oswego; 300 W. First St., Oswego; 707 S. Fourth St., Fulton; and 5828 Scenic Ave. (Route 3), Mexico. OCFCU was chartered in 1975 and serves residents and business owners of Oswego County. OCFCU serves more than 12,000 members throughout the county. For further information, visit www.oswegofcu.org.